Heatstroke is an elevation in body temperature not associated with fever/inflammation/infection, which occurs when a patient’s own heat-dissipating mechanisms cannot cope with excessive external heat. This is typically associated with temperatures of 41 degrees Celsius or higher, & is potentially fatal as it leads to failure of multiple organ systems. Cats & dogs cannot respond to heat in the same way we do, as we have sweat glands all over our bodies that help with temperature regulation, they only have a few in their feet & around their noses. Many animals rely on panting & external cooling to loose heat. Excessive environmental heat & humidity – this can be due to a very hot day (like we recently experienced) or being enclosed in an unventilated space like a room or CAR. Narrow upper airways or disease of the nose, nasal passages, throat &/or windpipe that inhibits effective breathing. START COOLING AT HOME/ON WAY TO VETERINARIAN – spraying down with cool water, immerse entire body in cool water, wrap in cool wet towels, place a bag of ice/frozen veggies between the legs. Apply convection cooling with a fan. Blood clotting disorders, kidney failure, brain swelling to name a few. PREVENTIONKeep pets with predisposing conditions (heart disease, obesity, old age, breathing problems) in a cool, well-ventilated space with adequate shade. NEVER EVER LEAVE YOUR PET IN A HOT PARKED CAR, EVEN IF IN THE SHADE OR FOR SHORT TIMES – the temperature in a car can quickly reach 60 degrees Celsius!!! Prevention is better than cure, as we can lose up to 50% of patients diagnosed with heatstroke. 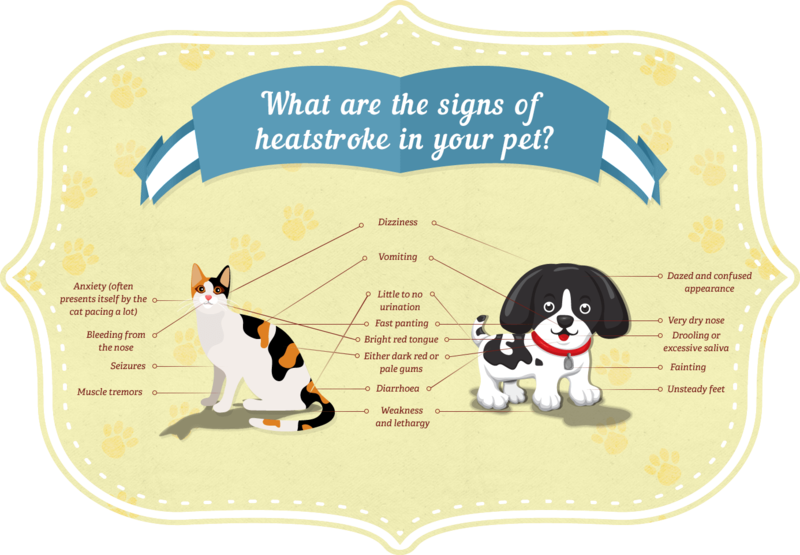 Only a small increase of 2 degrees Celsius in our pets’ temperature, can predispose them to heatstroke, & a patient can die within 15 minutes of heatstroke. Shocking!!!! Please be vigilant & aware of this lethal complication of summer.